Yesterday a crazy story of how Wired's Mat Honan got hacked was flying around the net. If you haven't yet read the post, you really should. It's a real eye-opener and made me think twice three times about my own passwords and security. One thing I jumped on that I never used in the past is Gmail's 2-step verification. This feature gives your Gmail account added security by requiring a code to be entered along with your password when logging in. The code is sent to you via a voice call, SMS or through an app and makes sure would-be hackers can't get at your email. 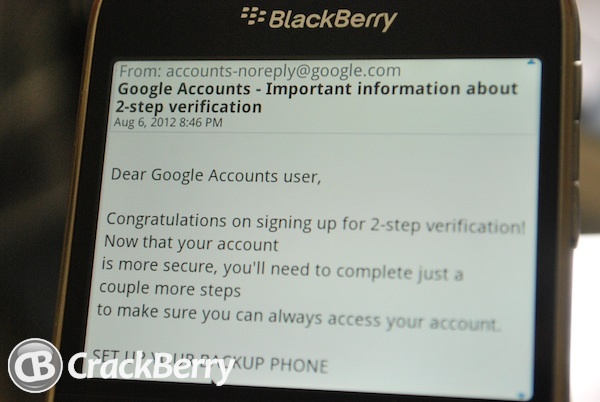 Keep reading and we'll look at how to setup 2-step verification for your Gmail account on your BlackBerry smartphone. First things first - you obviously need to have a Gmail account to use this feature. Sign in to your Gmail account from a PC and go to the 2-step verification page. Choose your country in the drop down menu, then enter your phone number. Enter your phone number and select Send verification code. You'll receive either a voice call or text message (depending on what you chose) with your code. Enter in the box and select Verify. Next you can choose to remember the computer you're using. If you check the box then you won't be asked for the code for 30 days when using that computer. Click Turn on 2-step verification to finish the process. That's it! Now when you login to your Gmail account from another device, you'll get a text or voice call with a code to verify your account. Pretty cool right? You can also use the BlackBerry Google Authenticator app (although I prefer just getting an SMS). Now that you're set up, you'll have to update the password on your BlackBerry. Google provides a special one-time password for this purpose. Login to Gmail and you will see a new screen explaining 2-step verification. On the bottom of the page, click the Manage Application Specific Passwords link. Scroll to the bottom of the page and you'll see a password generator. This generator lets you create passwords for applications that don't use 2-step verification like BIS, Google Calendar on other devices and Google Talk. Enter a name for the device in the box (Adam's BlackBerry) and select Generate Password. You'll get a popup with a 16 character password. Go to your email settings on your device and enter this for the corresponding Gmail address. Once you do that, you are up and running. You won't have to do anything further from your BlackBerry and you email should come in as normal. If not, you can do the above steps again to create a password for your BIS account. You'll have to do this for any other apps that need your Gmail login like Google Talk or Google Sync as well. For more help and discussion on this or other topics, head to the CrackBerry Forums for more.